In 2016, Pensacola attorney Mike Papantonio introduced Nicholas “Deke” Deketomis in his bestselling thriller “Law and Disorder.” Deketomis is a trial lawyer who has built his reputation on making large corporations pay for their bullying tactics. In the book, he finds himself fighting a murder charge when the mega-corporations fight back. Papantonio followed up this fall with “Law and Vengeance” that introduced Deke’s law partner Gina Romano who does battle with one of the America’s largest weapons manufacturers after one of the firm’s senior partners is murdered. 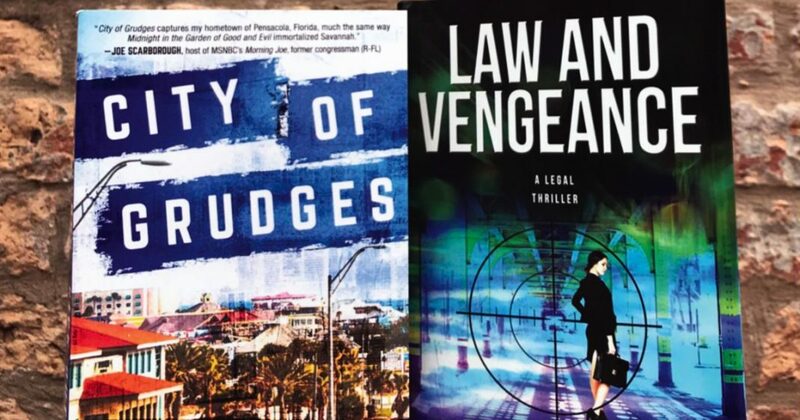 Inweekly publisher Rick Outzen has also entered the world of fiction with “City of Grudges,” which debuts March 13. In the novel, publisher Walker Holmes writes an article that gets one of the town’s most popular leaders arrested. Not wanting to believe Holmes, the city turns on him as dead bodies begin to pile up, and his enemies blame his reporting for destroying lives. His career, newspaper and life hang in the balance as he fights for vindication and redemption.